I was looking for AAVSONet telescopes that have either SA200 grating or different spectroscopic equipment. I wasn't very successful. So I decided to ask here - which telescopes have which possibilities? Also, is it possible to submit a proposal for spectroscopic observations using AAVSONet? So base any proposal on that configuration. Can you provide information on the proper fornat for proposals to use the robotic scopes for spectroscopy. In particular Im interested in the eShel system when it is available. Thanks. No spectroscopy for BSM-Hamren? But then, I guess a 65mm aperture would limit what targets pretty severely? Arne, thank you for reply. Do you have any examples of frames containing grating spectra, taken with TMO_61? 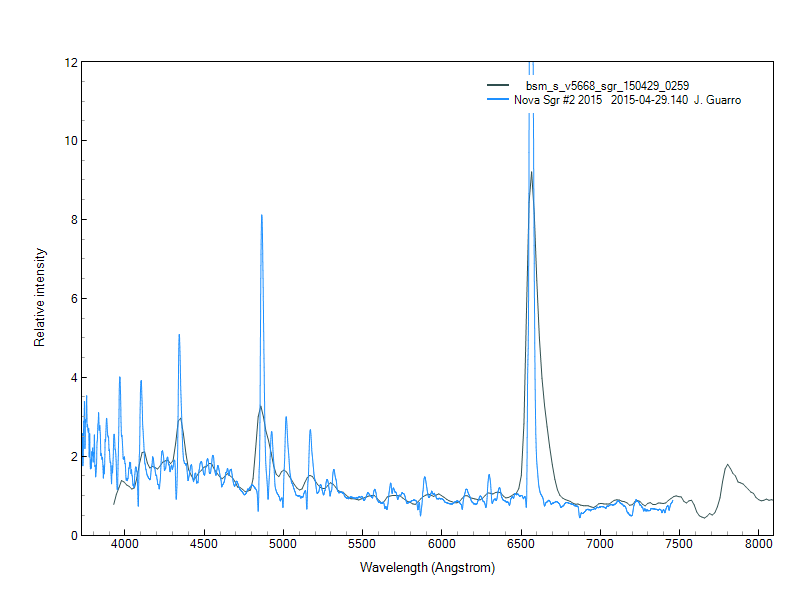 I would be interested in getting of as many spectra as possible around V838 Mon to calibrate "ancient" photographic objective prism spectra. For that I'd need to get spectra of field stars in the range of V~12..15, I'm trying to figure out reasonable exposure time(s) for TMO_61 to consider if this plan is feasible at all. You will use the normal proposal method for AAVSOnet for either photometry or spectroscopy. The gratings are easy to schedule; the eShell operation will not be fully understood until we've commissioned the instrument. MJUO has a student working on the final details of the installation, but I haven't heard when "first light" will occur, though I expect it soon. I just checked and the OC61 scope is in New Zealand at -43 degrees. That's great for the southern stars but too far south for most stars of interest in the Northren hemisphere. Are there any plans for an eshel system for a Northren hemisphere telescope? I may still write a proposal to observe one or more of the Orion Project stars with the eShel. It would be a good chance to check procedure and maybe even write up a user manual. I see the AAVSOnet still has User Manuals coming after several years. Too bad as they could help greatly and can be fined tuned as needed. Here's hoping for a more northern eShel system. Not all of the BSM telescopes have gratings. They are very small aperture, after all, so the number of targets will be more limited. I've tried to set it up so that there are two gratings in the north and two in the south. For BSM Hamren, the clear filter is used more than at other sites, and so I've left it with its original complement of BVRIC. That gives BSM Hamren capabilities that some of the other BSM systems will not have. The magnitude range is no problem; V=12-15 with a 60cm telescope and diffraction grating would be a few minute exposure. There would be some additional things to consider (and I'm sure Robin has some more). V838 Mon is a pretty crowded field, so there will be a fair amount of confusion in the spectra. Probably the best way to handle this would be two gratings, one oriented north/south and one oriented east/west, so that you can eliminate the contamination. TMO61 has only one grating right now, so that means some of your stars will not be useful. Second, most objective prism spectra were designed for spectral classification, and so have good response in the blue and poorer in the red, the opposite of what you will get with gratings+CCD. Finally, getting flux calibration for a grating is not easy, so what kind of calibration you are looking for may or may not be possible. It is certainly worth a try! I don't have a ready example of a grating exposure with TMO61. I only took a couple when the grating was added to the filter complement, and they are buried somewhere. I'll see about getting a new one (maybe V838 Mon, since that is also my favorite star!). The magnitude range is no problem; V=12-15 with a 60cm telescope and diffraction grating would be a few minute exposure. There would be some additional things to consider (and I'm sure Robin has some more). V838 Mon is a pretty crowded field, so there will be a fair amount of confusion in the spectra. Probably the best way to handle this would be two gratings, one oriented north/south and one oriented east/west, so that you can eliminate the contamination. TMO61 has only one grating right now, so that means some of your stars will not be useful. I'm aware of that overlapping problem. Because AAVSONet telescopes haven't equipped with field rotators, most probably thats the thing one has to take or leave. Now it all depends in which direction +1 order is aligned (that's important for V838 Mon for sure), it would be a bit easier with other stars in ~5+'x5+' FOV. I just hope that in the field, there are enough stars that produce either clean or not much contaminated spectra. Maybe one or two AAVSONet telescopes having those gratings could in the future be equipped with rotators to be able to find a "sweet direction" for almost every possible target? Of course, every added piece adds an additional flexure point, causes possibly extra vignetting, and costs money. Second, most objective prism spectra were designed for spectral classification, and so have good response in the blue and poorer in the red, the opposite of what you will get with gratings+CCD. Finally, getting flux calibration for a grating is not easy, so what kind of calibration you are looking for may or may not be possible. It is certainly worth a try! I'll see about getting a new one (maybe V838 Mon, since that is also my favorite star!). Our spectra are on Kodak 103E - they are visible up to Halpha. Currently the only possibility seems to be treating many objects simultaneously, building that way up a crude characteristic curve (or indidividual corrections to typical curve for such plates) and then try to evaluate V838 Mon itself. That would be really awesome if you could take a sample spectrum of V838 Mon by yourself. Seeing one of those real frames would allow to further optimize center of FOV and exposure time(s). I too am interested to see how the SA200 performs on TMO61 and an SA200 image of the field would give an idea of what we would be up against. Large aperture telescopes are a real challenge for this sort of setup and unless the seeing is good enough to keep the star image tight, resolution can be disappointing. If all you are interested in though is the shape of the continuum to do an instrument spectral response calibration, then the results could be good enough. If you are planning to measure several stars across the field simutaneously you would need to check for any flat field effects which as already mentioned are very difficult to correct for (The same problem could exist in the photogrpahic plates too of course.) Where a flux calibration is needed, the usual way round this with the Star Analyser is to measure a single object at a time, postioned in the same location in the field as the reference star. Some tests, moving a reference star around the field and watching how the spectrum changes would be a good thing to try on these setups to see how severe a problem this might be. Measuring faint stars in a crowded field can be a nightmare. Contamination from zero star images are less of a problem as they appear as points in the spectrum in expected locationsand can be cropped out. More insiduous if you want an accurate continuum shape is overlap from other +1, +2 -1, orders from other spectra. Add in the complexity of wanting to do this for several stars in the field simlutaneously and avoiding contamination may prove impossible. I do remember reading of an example where all this could be disentangled during reduction but it looked mighty complicated. These instruments would be able to produce reliable spectra calibrated in relative flux but only one target at a time of course. yes, I'm interested mainly in continuum shapes. Several years ago I tried to do the similar thing with our 1.5m telescope here at Tartu Observatory, but that was only barely possible - V838 Mon is always below airmass 2 here (seeing 4+ arcseconds almost always, strong differential refraction, and other 'nice' effects....). 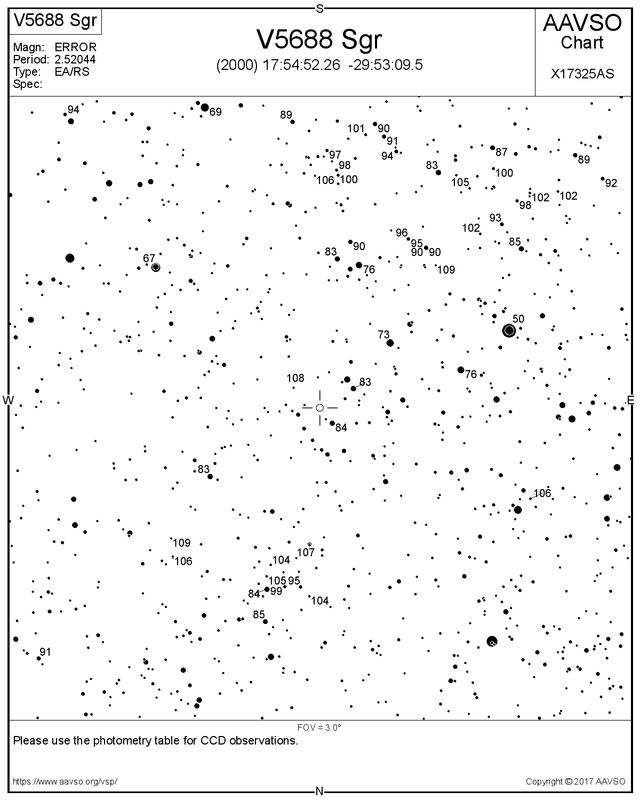 That time we were able to point the telescope only on those targets that were visible in video guider, I got few 13th magnitude stars around V838 Mon with R~1000 but the number and magnitude range of available stars was not nearly enough. V~15 would be needed for sure. Howard Bond has spectra of many of the stars near V838 Mon, taken while he was hypothesizing a young B-star cluster surrounding the nova. I seem to recall at Ulisse Munari also acquired field star spectra. Unfortunately, I was into JHKL imaging by then and had no access to a spectrograph. I'll let you know when I get a test grating image of V838 Mon with TMO61. I've uploaded 4 images from a couple of nights ago of the V838 Mon field. The grating is rotated from where I'd like it to be, but this gives you an idea of what is possible. The camera on TMO61 is a QSI-683, so the pixels are small and the full-well is limited. That makes it a less than ideal system for spectroscopy, where dynamic range is always nice to have. Spectrum of V838 Mon is very interesting as I am Interested in recent behavior of V838 Mon. By the way, how about configuration of TMO61. I want to setup SA100 with my telescope. But I am worried about distance between SA100 and CCD. Filter position may be too far from CCD in my Telescope. And, does someone know grating similar to SA100 or 200 but 2 inches size? Formally, baader planetarium had but it is now discontinued. Regarding your concern about the distance the SA-100 is mounted. We developed our grating calculator to help determine the best mounting position for 100 and 200 line/mm gratings. See www.rspec-astro.com/calculator. Note that it is possible to mount the1.25" SA-200 in a filter wheel that uses 2" filters. See http://www.rspec-astro.com/star-analyser-200/#mounting for information on the mounting kit. Note that as the dispersion takes place after the grating, provided the zero order is within the unvignetted area the spectrum will not be vignetted and no throughput will be lost, even in a system where a 1.25 inch filter would vingnette edges of the imaging field. The cost of gratings tends to scale approximately with area so you rapidly come to the point where the simple Star Analyser concept is not cost effective. (I seem to remember the Baader 2 inch (and 4 inch!) gratings were rather expensive.) Paton Hawksley have made larger gratings as a one off special order in the past though, particularly for objective grating setups for larger aperture camera lenses. The Cokin 240 l/mm filter is not really suitable for this application as ~85% of the light passes straight through into the zero order and only ~5% of the light ends up in the wanted spectrum. This is not surprising of course since its primary use is as a photgraphic effect filter where you want most of the light in the image and a small amount diffracted to give the desired effect. I have no idea if they have anything ready made that is really useful for your specific application. Some companies offer also custom sized gratings, ask them. Few years ago I ordered large(r) (120x100mm) custom gratings from Newport (www.gratinglab.com), and when they finally answered to my e-mails, everything went quite smoothly. Their customer service and engineers were very helpful. Thank you all, ansower about 2" gratinf. I will try adoptor 1.25" to 2" firsrt. And I will also try to get 2" grating. If the wheel is designed to take 2 inch screw in filters (48mm thread) then either one of these adapters might save you some trouble instead of making up your own adapter from the kit and a blank filter cell but check you have enough clearance in the filter wheel. Thanks go to Walt (CWT) for finding that one. I ordered "TSFI2-1 Adapter for 1,25 inch filters to 2 inch filterthread" for my SA-100. What is the current status of spectroscopy with the AAVSO? What work if any is being done with the instruments currently available? A realistic honest update would be appreciated. SA-200 gratings exist on BSM_NM and BSM_Berry. They are not used very much, if at all. Therefore, it is difficult to say how effective they will be. Submit a proposal through the usual channel and the TAC will consider it and we will get it into the queue. Frankly, it may have some growing pains but we won't know without use by members like you. Larger spectrographs exist on two large scopes but they are currently in need of system fixes. So ,I have no specific info on those other than we hope to get them working at some time? I have an SA200 in my filterwheel of my remote setup. I could help out if of interest to you guys and you take up the analysis of the images. Thanks for the update - it would be good to hear what is happing to the "other spectrograph" instrumentation which started commissioning back in 2015! For the grating installations - to evaluate the usefullness on selected target objects, is it possible to at least get some indication (a couple of sample star shots - A type stars, would be even better) of the actual grating installed, spacing between the grating and the camera, and details of the cameras, pixel sizes being used. What are the current (useful) maximum sub exposures being obtained on these instruments? Are they programmed to "off-set" the target star to match the dispersion and blaze direction of the grating? Can the system also compensate for the focusing on the spectrum rather than the star image? Based on the response the interested spectroscopic users may then be able to make the decision whether or not to apply for "imaging" time. look at images 618, 619. Target PNV_J183657 is the nova V5668 Sgr. We have extensive grating monitoring of this object, available if anyone wants to work with them. In both cases, we focused on the spectrum and not the zero-order image. The two larger-telescope spectrographs are slowly being commissioned. We don't have any "champion" for them, nor is there any current infrastructure or funding support at HQ, and so they take lower priority than standard imaging. I expect them to eventually come on-line. There are no technical details on the BSM_Berry page, so I assume it uses the same Tak 60 set-up? It appears the images are stored in ""Images.aavso.org/BSM_?? ?/"" but this only shows the low resolution jpg - where can the high resolution images be found?? I'd like at least to analyse the available data. Are you aware of any other BSM spectral images taken after 2015? The spectral jpg images are too low a resolution to be useable and the blazed 1st order seems to be saturated....I've looked at the unblazed 1st order as a start. However, I can't seem to match either the filter images or the spectral images to the AAVSO finder chart X1732AS. What am I not doing correctly??? Chart X1732AS doesn't exist; I think you are missing one number in that name. The field of view of a BSM is about 2.2x1.4 degrees. There are standard filter images prior to the grating image that can help you get oriiented. The bright object near center is of course the nova; the next brightest object near the top of the frame is the 68 comp, and there is a nice crescent of stars near the left of the frame that is just barely visible in the right of the field for the standard 1-degree chart obtained from the "Pick a Star" option on the homepage. I think there is a top/bottom flip, and then perhaps a 180-degree rotation due to the GEM. I don't have any more recent data than 2015, sorry. I was experimenting with the diffraction gratings during the group purchase time, and no one has requested grating images since. BTW, there is also a grating on BSM_S. There used to be a 4th grating at BSM_HQ, but I removed it in 2015 to insert a U-band filter (dang those 5-position filter wheels!). They are compressed using the bzip2 algorithm, which many Windows compression programs will support. If you look at them with MaximDL, be sure to add 500 offset to each image so that it displays negative values correctly. There should be a V5668_Sgr image for each telescope, plus a couple of S Ori images for additional browsing. I haven't looked at these 5 images other than to transfer them, so I won't vouch for their quality. As I said, there are 3 BSMs with such gratings. The focus might need to be tweaked slightly, but otherwise I think they are ready to be used. If you are an AAVSO member, you can submit a proposal to monitor anything you wish with those gratings. Sorry the generated chart was X17325AS. yep, sorry. It is easy to make a typo, and I gave the wrong GCVS name. The nova is V5668 Sgr, not V5688 Sgr (which is what your chart is for). I'll edit those posts that I can to revise the name. My apologies. 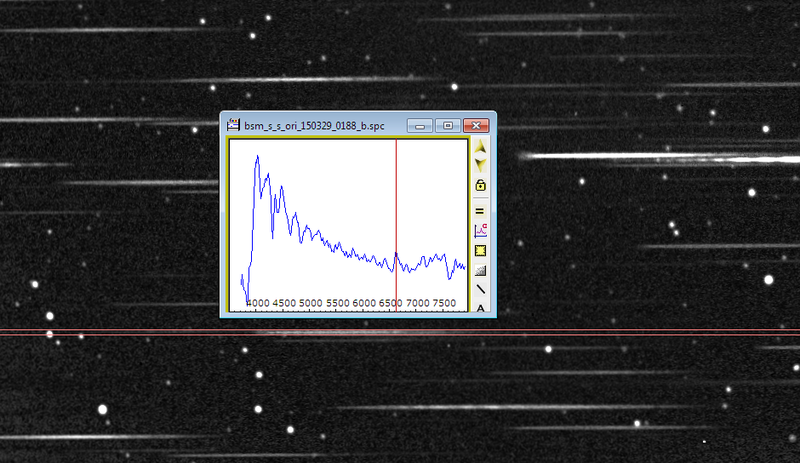 OK, I've had a look at the V5668 Sgr spectral data from BSM_nm, BSM_berry and BSM_s. The BSM_berry image has severe vignetting, and the BSM_nm is very noisy. Each showed a bright point in the spectrum, a check against UCAC4 did not show up any significant star overlap. This turned out to be Ha emssion. Best results came from BSM_s. Note: Every star recorded in the field becomes a valid spectral target! TYC6870-890-1, 18h39m51.22s -28d39m20.19s an M6D star, mag 10.3 was noted by its typical Mira type spectrum. All spectra were extracted with AstroArt6 and processed by BASS Project. If any members wants additional detail, 1D fits files etc. let me know. Thanks, Ken, for your analysis! These are wide-field refractors, and as such, will exhibit vignetting in the field and defocus across the spectrum. However, they can still yield reasonable low-resolution spectra that are useful for certain projects, such as large-scale evolution of novae spectra or classification. You can't beat the ease of use of a diffraction grating. And as you indicate, this can be effective for multiple souces across a field, and to pretty faint magnitudes, considering these are 60-70mm aperture telescopes! I'll leave the 5 spectra up on the ftp site for a while, in case anyone else wants to work with them. Actually the vignetting does not seem to bad in the BSM Berry image (~5% centre to edge). It is the very high (~27k ADU) sky back ground which makes it look bad and has impacted the SNR too of course. By my reckoning based on the header it was taken in dawn twilight, about 30 min before sunrise ! H alpha P Cyg emission star?